Windows 8 and later versions contain UEFI Firmware settings that replace regular computer BIOS. UEFI Secure Boot prevents external interventions like USB drive, installing hardware and other operating systems. 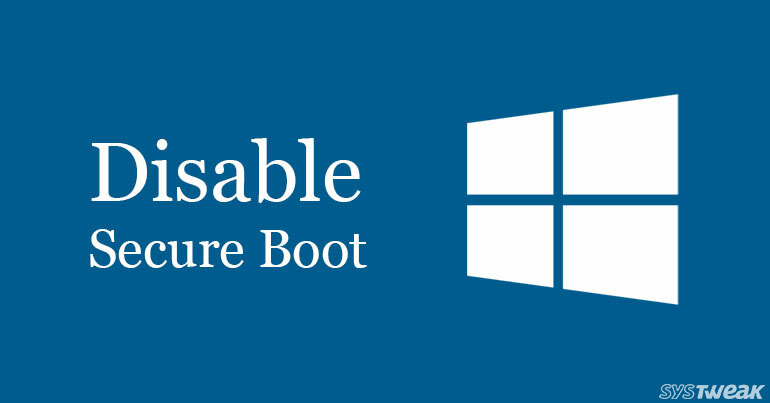 However, if a computer manufacturer wants to incorporate Windows 8 or above in their PCs, they need to enable a feature called “Secure Boot”. The regular BIOS is not capable of detecting malware like rootkit that impersonate as boot loaders and attack your computers. It cannot differentiate between a genuine boot loader and a malware. Secure Boot in UEFI helps check the bootloader and prevents such attacks. It basically assures that your system boots only using an entrusted firmware that is verified by your computer’s manufacturer. Unfortunately, enabling Secure boot also stops you from installing operating systems like Linux, earlier versions of Windows, run graphics card, or include hardware that are incompatible with Secure boot. Here are the following steps that will guide you on how to disable Secure Boot in Windows 8/8.1/10. You may need to reset your PC to factory defaults for re-activating Secure Boot in your PC. Any changes in BIOS settings will affect computer operations. Make sure that you follow these steps actively. Disable Secure Boot only if required. Your PC manufacturer timely updates the list of trustworthy operating systems, drivers and hardware for your system. You can check them on your manufacturer’s website or in Windows Update. Click on Troubleshoot and then click on Advanced Options: UEFI Firmware Settings. Look for Secure Boot. you will find it in “Authentication” tab, “Boot” tab or “Security” tab. Disable it, saves changes and exit. You can use arrow keys to navigate on the page. Now, you can install the preferred program or driver on your system. You can follow the same process to re-activate Secure Boot in your computer. However, there are Linux distributions that are allowed to install in Windows with Secure Boot enabled. Furthermore, linux distributions can be signed for a fee of $99 (one time) to get enlisted in the trusted operating systems. Hence, Secure Boot offers control to users where you can disable the feature as per your preference. Moreover, already signed Linux distributions can be loaded to your systems even if they Secure Boot is enabled.